I recently purchsed and installed the FSA Gossamer Road power meter but am having issues with low power readings. I'm wondering if anyone has had similar issues. I am testing on my indoor trainer (CycleOps Fluid 2). As an example when I'm on a gear of 50/19 and 90 cadence the power reading is around 90 watts. Any idea what the problem might be? just contacted you by mail, let's figure out what's going on by looking at some files and comparing what's going on. I'm sure we'll find out quickly what the situation is. did you order through the European or US Shop? The certificate is pretty stealth - unless you open the manual you won't see it. Have fun in the alps - nothing less than 300 watts on the climbs, please ;-P.
Just Back from the Alps... I checked and the Calibration certificate is inside the manual front page as you described .. Thanks. good to hear that everything worked out :-). Enjoy your power2max! Won't be there but do have an upcoming race. What battery type does it use? you'll want to get a 2450N from Renata (http://www.amazon.com/...eywords=renata+2450n) - the brand is important, others will not always work reliably, for some reason the manufacturers all make them a bit differently. Just checked and I must have ordered several of these about 6 months ago or so. They've been in my garage. Is it advisable to keep these in a refrigerator? I'd hate to put in a "bad" battery that has been sitting around. Next time I probably won't order so many. 6 months shouldn't be a problem, but don't put the batteries in the fridge - cold temperatures kill batteries pretty quickly. Best just keep it at room temperature. Good luck with your upcoming race! Which crank setup would you recommend for BB30, running an Ultegra Di2 groupset? Are the chainrings all that matter? I'm also looking to go from the stock 130 BCD standard setup (either an Ultegra [53/39] or Vision Trimax [52/38], depending on which bike I buy) to a compact, if that matters, so I won't be reusing the stock chainrings. I don't mind swapping bottom brackets if necessary. If you are switching to compact we have Praxis Works chain rings as an optional upgrade in 52-36 and 50-34, which give great shifting performance. Have a P5 and been using my old Quarq GXP power meter with adapter. BTW, have been happy with the Quarq. But I am now ready to bite the bullet and get a BBright native PM solution. The bike came with a Rotor 3D+ aero crank that has been sitting there unused. So with the Power2Max solution able to function with the crank this has steered me towards this solution. I see that Power2max works with the Rotor 3d+. But does it work with the Rotor 3D+ aero version? Maybe a dumb question but I would hate to purchase and find out it does not work. I am also curious on the lead time to receive. I have a race coming up. Thanks in advance for the help. I ran into this problem. The current 3D+ 110 BCD aero ring is incompatible. There was no mention of this on the website when I purchased. The alternative is either wait until the new model in Feb or dremel a home into the chain ring. Yeah, I meant hole. Here's the pic they sent me. I've searched the forums and the internet and from what I seen I should have no problems fitting my recently ordered P2M on my 2011 Cervelo P2. However, the bike is now at my LBS and they say it is not allowing it to spin as it is hitting the chainstay. From what I read it was supposed to be a no brainer swap/fit. My LBS has tried to contact P2M via email, but so far no response. Anyone else experience this or can offer some help ASAP. I don't have technical solution but have our LBS check their SPAM mail folder. There's some weird issue where all emails from Power2Max get flagged as spam. It has happened to a number of people (including me). Did the LBS say what is hitting the chainstay? Hi, Do you know if the other payment methods will be available in Europe as well as the US. I am in the UK but still seems to be bank transfer only. @bartturner: The Rotor 3D+ aero only differs in the spider (apart from the chain rings). Since the spider is replaced by the chain rings it doesn't make a difference. Regarding modifying aero Q-Rings: this is only necessary on compact rings. If you use 130BCD it is not necessary to modify them. @qngo01: thanks for posting the picture! @boing: in Europe it's bank transfer for the moment. I will post something if other options become available. Thanks for your understanding. I also noticed that P2M has stated on the forum in the past that modifying the ring is not recommended. Is this more of what the official message needs to be for liability and such. Or is there a practical reason? I am comfortable machining aluminum and have a mill and appropriate cutters to perform. In looking at this solution and reading about the crank that came with the bike I am now interested in trying a Q-ring in the future. 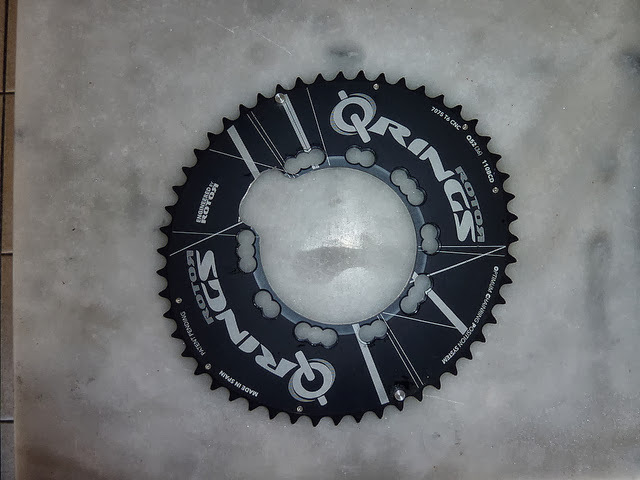 In the future could I switch the ring to a Q-Ring, do the machining modification on the new ring, and use my original power meter without sending it in or performing any other modifications to the power meter? What are my crank options with power 2 max with the new 2014 cervelo p3. Will the lightning crank work? Off to the race. Will reply tonight or tomorrow. I am looking to purchase the Power2Max and presently have a Rotor 3D+ 110BCD crank and aero chainring. I understand the Rotor 110BCD aero chainring is not compatible. Can I purchase the Power2Max with the pre-installed Praxis Works chainring and use the Rotor 3D+ crank? Does it matter which Praxis I purchase as in Compact, semi-compact, classic? So how did you do Nick? Maybe there should be a "Power2Max Kona Athletes Results" thread!? @bartturner - I have the same setup, Rotor 3D+ 110BCD. I too have the Rotor aero Q ring. For this to work you need to remove some of the chainring so that it fits over the P2M battery compartment. Here's what it should look like.